Creamy risotto full of meaty portobello mushrooms and a hint of cabernet sauvignon. Family, food, and wine are the perfect trio for a memorable holiday season. A few sips of wine and good conversation with loved ones, and the season is instantly merry and bright. Today I’m partnering with Gallo Family Vineyards to celebrate the holidays and create memories around the family table. 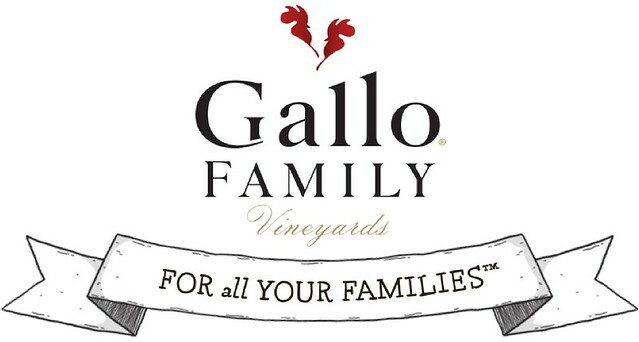 Gallo is a family-owned and operated winery started by brothers Ernest and Julio Gallo over 80 years ago. They’re the world’s largest family-owned winery and exporter of California wine. From fruity reds to vibrant bottles of bubbly, Gallo distributes a plethora of wines from various regions across the globe. It doesn’t get much better than sipping an effervescent glass of bubbly surrounded by friends and family around the warm glow of a Christmas tree. Oh, but it can. Wine is delicious straight up, of course we all know that, but when you add a few glugs to a recipe, it can really enhance the flavors of a dish. The important thing to note when adding wine to a recipe is to use a bottle of wine that you like and would normally drink. If you don’t like the wine you’re drinking, don’t add it to your recipe, because if you don’t like drinking the wine, you’re not going to like eating the wine. I’m using Gallo Family Vineyards’ Cabernet Sauvignon to make a creamy, cheesy mushroom risotto. If you’ve never had risotto, you definitely need to try it. It’s unlike any rice dish you’ll ever have. Risotto is made with Arborio rice that plumps and becomes creamy with the addition of warm stock (chicken, vegetable, or beef). It takes a bit of attention in the form of stirring and ladling broth, but it’s worth every moment of effort. From start to finish, risotto takes between 20-30 minutes. At the end of the cooking process a generous handful of freshly grated parmesan cheese is added, because, let’s face it, cheese makes everything better. What meal would be complete without a glass of wine? Grab a fancy glass and pour yourself a glass of your favorite wine as a treat for laboring over a hot stove. Have you ever noticed that wine tastes better from a pretty glass? It’s true. I’ve tested the theory. Take a sip of wine from a plastic cup and then from a fancy glass and tell me which glass of wine tastes better…the wine from the pretty glass, right? I used sliced portobello mushrooms to beef up this dish. Mushrooms have a delicious, almost meaty flavor when browned. The key to browning mushrooms is to heat the oil or butter before adding the mushrooms to the pan and refraining from adding salt until the end of the cooking process. Adding salt in the beginning causes the mushrooms to release water and steam instead of brown, so always salt your ‘shrooms at the end. The end result is a pot full of velvety, plump arborio rice full of fat slices of meaty portobello ‘shrooms, earthy thyme, and a hint of oaky cabernet sauvignon. Top with freshly grated parmesan and you have a pot of creamy goodness that you’re family will love. Serve as a side or as the main course. Visit Gallo’s large selection of wine and enjoy a $2.oo off coupon on any Gallo Family Vineyards wine. Test out Gallo’s family crest builder and create your own family crest. Follow Gallo on Facebook, twitter, Instagram, and YouTube. Bring beef stock to a simmer. Heat olive oil and butter in a large saucepan over medium-low heat. Add the onions and mushrooms; sauté for 5-6 minutes until the onions become translucent and the mushrooms begin to brown. Add the garlic and cook for 1 minute. Add the arborio rice and sauté until nutty and fragrant, stirring frequently so it doesn’t stick to the bottom of the pan, about 3-4 minutes. Add the wine and thyme to the pan and cook until the wine reduces and absorbs into the rice, about 2 minutes. Begin ladling in the warm stock, one ladle at a time, stirring frequently. Allow most of the stock to absorb into the rice before adding additional stock. Continue adding stock one ladle at a time until the rice is tender, but not mushy, about 25-30 minutes. Stir in the parmesan cheese and season with salt and pepper to taste. Serve immediately. I recommend waiting until the end to season with salt in order to prevent over salting. As soon as cold weather hits it sparks me to crave risotto. It’s so soul warming and comforting. I can’t wait to try yours. Wow, this looks OUTSTANDING! And you made brown risotto gorgeous…I want to dive right in! mushroom risotto? easily one of my favorite comfort foods, because…well: the “because” is all in the title. MUSHROOMS. RISOTTO. you make me this, you make me happy. Your risotto looks absolutely perfect! I would absolutely devour this! It has been so long since I have made real risotto. Your mushroom risotto looks phenomenal! Risotto is on my to make list for the year. I actually have been wanting to try a mushroom risotto and this looks amazing! I’ve never made a risotto with beef broth, I’ve GOT to try this! Nice hearty dish! Oh and I have a collection of pretty wine glasses :) Your theory is by far correct my friend! I adore risotto and never thought to use wine. This must change. What a beautiful recipe and photography Jenny! I adore risotto…I made one once with red wine, and it came out purplish. Tasted great, but the color made me laugh. Your risotto came out a lovely rich brown color…great veg option for my SIL (if I use veg stock). This looks so rich and delicious. I can definitely see me eating it as the main course…with a bottle of wine on the side! I was so excited when I saw your sneak peek. This sounds awesome! I love mushrooms, I love wine, and I love risotto. You and I are thinking alike in the risotto camp! Yours looks fabulous! This is such a gorgeous dish!! Love it! MMMMMMMMM! I love mushroom risotto and your recipe looks so great with that red wine all up in it! A delicious Sunday Supper menu item for sure! I can’t believe I have never tried risotto before! This looks SO good! I love mushroom risotto and this looks great! This will certainly be a holiday hit! The browned mushrooms in the recipe make it absolutely irresistible. Thanks for sharing!! Thank you so much, Shannon. I think browned mushrooms are the best kind of mushrooms. Can’t go wrong with mushrooms and wine! This is a delicious looking risotto! Thanks, Meghan. It was so hard trying to get that risotto to look pretty for its photo shoot. You know how to make risotto look so pretty! That cabernet doesn’t hurt either. I sure could go for a steaming plateful of this tonight. Thanks, Susan. It was no easy task trying to get that risotto to look pretty.